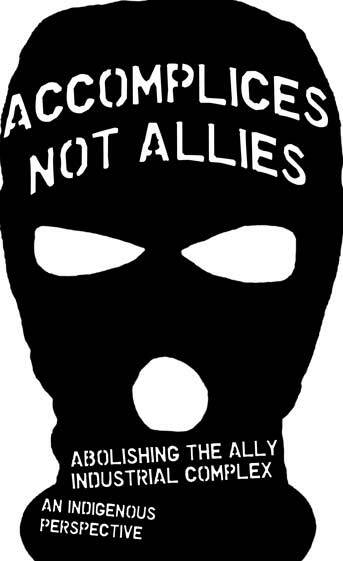 The ally industrial complex has been established by activists who’s careers depend on the “issues” they work to address. These nonprofit capitalists advance their careers off the struggles they ostensibly support. They often work in the guise of “grassroots” or “community-based” and are not necessarily tied to any organization. It’s important that members of settler culture ally themselves with indigenous communities fighting for their rights and survival, but there are right and wrong ways to express solidarity. The following guidelines have been put together by Deep Green Resistance* members with the help of indigenous activists. They aren’t a complete how-to guide – every community and every situation is different – but they can hopefully point you in a good direction for acting effectively and with respect. *Unsettling America Editor’s Note: While we understand and certainly agree that DGR is highly problematic, we are not seeking to promote their brand name. Rather, it is our understanding that these guidelines were developed with the guidance and help of indigenous allies of the Great Plains chapter, which did some pretty outstanding indigenous solidarity work, and also dissolved as a DGR chapter due to internal movement racism and colonial attitudes within the DGR ideological leadership and central cadre, only to reform as a POC radical environmental group, Deep Roots United Front. We understand that DGR now carries these guidelines as movement policy, but their origins are will folks who have left DGR (they were crafted by ex-DGRGP member and DRUF co-founder T.R. McKenzie along with Olowan Martinez and Waziyatawin). As guidelines, we feel that they’re relatively solid and stand on their own merit, but of course we’d be interested in adapting/expanding them and taking DGR’s name off of them, regarding which we are currently in communication with DRUF. While we have featured content from the likes of Derrick Jensen, we are highly concerned with and critical of DGR’s hierarchical authoritarianism, TERFism, and general colonial attitude towards indigenous and POC folks. Remember that decolonization is a process for both the colonizer and the colonized. 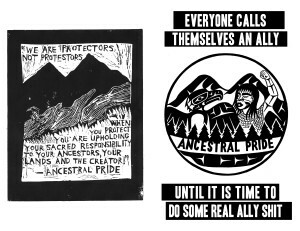 RECOGNIZE – If you are non-Native, recognize your place as a settler on occupied Indigenous lands that are still under active and ongoing resistance. SOBER – Respect the destructive influences of alcohol and drugs on Indigenous communities. Always work sober within Indigenous spaces and projects. NEVER bring drugs or alcohol into Indigenous spaces. LSP is a sober project and any person under the influence will be asked to leave. CULTURAL RESPECT – Working as an ally to Indigenous people does not entitle you to their spirituality. Leave your own cultural and spiritual baggage at the door. Cultural appropriation destroys opportunities for Indigenous solidarity. ELDERS – NEVER speak over an Elder who is talking. Be patient during pauses in their speech. Make sure they are fed first. Assist them when they ask. Defend them from harm. CEREMONY – Only participate in Indigenous ceremony if you are specifically invited. It is not traditional to participate in another Nation’s ceremony unless it is intended to be open. PROTOCOL – DO NOT take pictures or video of Indigenous ceremonies unless given the approval to do so. NEVER photograph or video sacred objects like pipes, medicine bags, masks, totems, etc. If in doubt, ask! If there is no one to ask, don’t do it! LEADERSHIP – Defer to Indigenous leadership, decision-making and priorities. Follow their lead. MAKE SPACE – Suppress enthusiasm for your own ideologies, beliefs, ideas and solutions to further empower problem solving and decision making among Indigenous people. You are not here to “save” Indigenous people but to be allies in a struggle for survival. PATIENCE – Work patiently at the speed of Indigenous leadership, reflection and decision-making. Deadlines are usually less important than acting in the most thoughtful (effective) way. INTEGRITY – Always do what you say you are going to do. Always. Work with integrity. When given a task, do it to the best of your ability. When you mess up, apologize earnestly. ACCOUNTABILITY – Be accountable to the communities you serve, including traditional Elders and warriors who are the customary leaders or defenders of their people. COMMUNICATION – Expand opportunities for Indigenous people to speak for themselves. PREPARE – Emotionally prepare yourself for solidarity work including the ability to deal with criticism. Solidarity work is a chance to learn and grow new skills and perspectives. DECOLONIZE – Decolonization repatriates Indigenous lands and lifeway for both the colonizer and the colonized. Decolonization is the key to effective long-term solidarity. The Two Row Campaign and Syracuse Cultural Workers have just published a beautiful new poster titled “How to be an Ally to Indigenous Peoples.” The full color poster features an Onondaga Gustoweh (headgear) by Onondaga artist Josephine M. Cook. The wording has been developed over many months by the Two Row Campaign in conjunction with our friends at Syracuse Cultural Workers. The poster features important information to be shared far and wide. It’s a great addition to classrooms, community centers, schools and other venues, and makes for a great gift. The 12″ x 36″ poster is available for $15, and bookmarks and postcards are $1 each or 12 for $10. They will be available for sale at Two Row events or you can purchase them online or via phone, 800.949.5139, from Syracuse Cultural Workers. Please mention “Two Row” and nearly half of your purchase price will support the Two Row Campaign! While we certainly agree that DGR is highly problematic, we are not seeking to promote their brand name. Rather, it is our understanding that these guidelines were developed with the guidance and help of indigenous allies of the Great Plains chapter, which did some pretty outstanding indigenous solidarity work, and also dissolved as a DGR chapter due to internal movement racism and colonial attitudes within the DGR ideological leadership and central cadre, only to reform as a POC radical environmental group, Deep Roots United Front. I know DGR now carries these guidelines as movement policy, but their origins are will folks who have left DGR, to my understanding. (Edit: just confirmed they were crafted by ex-DGRGP member and DRUF co-founder T.R. McKenzie along with Olowan Martinez and Waziyatawin.) As guidelines, I think they’re relatively solid, but of course I’d be interested in adapting/expanding them and taking DGR’s name off of them. Maybe I’ll check in with DRUF to see if they’d be interested in helping craft these into something even better. Thanks for the encouragement. While we have featured content from the likes of DJ, we are highly concerned with DGR’s hierarchical authoritarianism, TERFism, and general colonial attitude towards indigenous and POC folks. we may not have the intention of promoting them, but featuring their content is an endorsement of not only the work they have produced, but of the individuals who created the work. i appreciate the edit to acknowledge Derrick Jensen’s/DGR’s problematic politics – perhaps it needs to be unpacked further. while i agree that their guidelines are solid and well put together, they are words that have not been backed up by the actions of their organization. it is important to hold them accountable. Thank you for this list to share far and wide….We need a few revisions for a Canadian version of; How to be an Ally. June 21st is National Aboriginal Day. Know the legal rights and status of unceded and/or treatied land where you live? This is a really informative site, so as the content is really moving, I read some of your blogs and I can dearly relate to the passion you have. Some prefer modernization than go back to the past where their ancestor walks in, they prefer now than the past and because of this their identity is fading away. There are organization who are trying to re-create and go back to their roots, it is amazing how dedicated these guys are.